New federal environmental regulations call for substantial emissions reductions from U.S. power grids. For a system designed for fossil fuel resources, this will mean transforming the grid to accommodate large increases in renewable energy resources. Opponents of such regulations claim that the integration of these resources will impose high costs on the system, in particular those related to maintaining reliability standards. A new Synapse study finds that these claims are overblown, and that the costs to integrate increased amounts of wind and solar energy are minimal. Actual costs found by integration studies across the country are on the order of half a cent per kilowatt-hour of energy the resource produces, according to the Synapse literature review. The solutions to effectively accommodate large amounts of renewable energy onto our grid include: increasing cooperation between system operators, increasing the geographic diversity of installation sites, investing in new transmission, and improving demand-side solutions such as demand response and time-of-use rates. Grid operators are already in the process of implementing these measures, according to the Synapse report, called A Solved Problem: Existing Measures Provide Low-Cost Wind and Solar Integration. The report describes these measures and reviews existing studies of the costs of integrating renewables at various levels of penetration. The authors reject the idea that one expensive measure—the practice of “firming” wind energy by balancing it with natural gas generation at every hour—is necessary in light of other low-cost options. 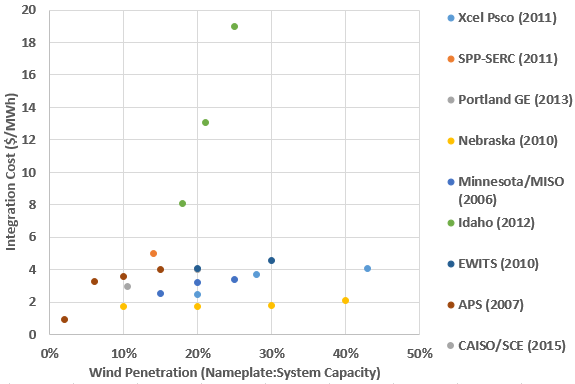 The figure below presents the costs of integrating wind energy found by nine studies. Costs range from $0.91 to $19.01 per MWh; however, most systems incur costs less than $5 per MWh (or half a cent per kilowatt-hour). The report provides further detail on the methodology used by each study. Costs of integrating solar tend to be similar ($1.53 to $6.30 per MWh), with fewer high-cost outliers. These costs do not represent the capital or operation and maintenance costs for the resource (which have been declining rapidly in recent years), but rather the cost of accommodating the resources in the current system. The return on investment is extremely high: a recent Synapse study found that consumers could save $41 billion in 2040 in a clean energy future in which renewable resources make up 70 percent of all generation. The authors of A Solved Problem will discuss the report in a webinar tomorrow, August 26, at 2 PM EST. To register for the event, visit http://bit.ly/1KAsDrJ. The panelists will discuss renewables integration in the context of EPA’s Clean Power Plan, which calls for a ramping up of renewable resources across the country.